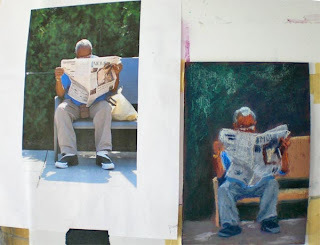 Daily painter followers and collectors know about the work of Karin Jurick. She is such an interesting artist and has developed a great on-line and professional presence. My favorites are her paintings of people looking at paintings. 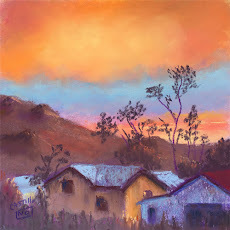 Karin's blog is one of the most popular daily painter blogs among other artists and collectors. She recently started a new blog, Different Strokes from Different Folks, one painting by many artists. She posts the photos every Wednesday and artists have a week to paint and send their paintings to Karin. It is very interesting to see the many styles and media that are used on one photo. It started with her dog, then a beach scene, and this one that I have submitted an entry, News Photo. This is the painting on my easel out on the carport beside the photo I was working from. What a great day for painting, nice and cool there. I worked on it for about two hours. The deadline was about 10 minutes from now, so I hope my painting arrived in Karin's mailbox in time to be posted. The finished painting. I see many corrections now, but I did want to get it posted and it isn't too bad for a quick, freehand painting. Jo: What a neat painting, I thought you did all your paintings freehand. Maybe I don't know the terminology. 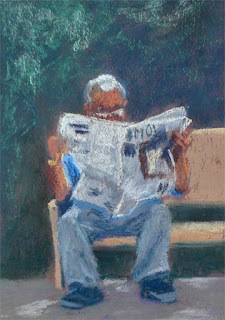 I like your man reading the paper - it does seem different from your other paintings - very nice. I will check out Karin's new blog. This looks great Jo. Have fun with this project. It looks like fun. I like it Jo. You are taking on the challenges and new subject matter aren't you? bag blog, thanks. It is a little different. Interesting to try something new. Linda, thanks. You are an inspiration to try new things. Rose, thank you. You are really doing well in your new challenge of oil painting. You might try this, too. Kasie, yes that is a fun thing to do. I guess mine got there too late. I didn't send it until almost midnight and she had already posted the next one with the pumpkins/squash. I may try that, too. Hi Regina! That was a fun exercise. My guy has pretty long arms if he were to stand, look like a chimp. :) My junk food series never developed did it?? Ahhhh. One of these days. Jo - Great job on this!!! I really enjoyed checking out the site and seeing all the different versions!!! Hi Joan, thank you. This is a great project and Karin is very generous with her time for setting it up and sharing her painting. Mine evidently arrived too late, we were peeling chile and I didn't get it posted. I did get it done, though and that is very important. :) Maybe next time.